Kremlin spokesman: No bilateral meeting between Putin and Netanyahu during November 11 visit to Paris, but they may hold brief conversation. Russian President Vladimir Putin’s agenda for his November 11 visit to Paris does not include a bilateral meeting with Prime Minister Binyamin Netanyahu, Kremlin Spokesman Dmitry Peskov told reporters on Tuesday, according to the TASS news agency. The two leaders may, however, hold a brief conversation during the day’s events, he added. "The Paris visit’s agenda includes only one bilateral meeting, which will be with [US President Donald] Trump," he said, adding that preparations for the meeting "are underway." "Apart from that, Putin is scheduled to attend memorial events [marking the 100th anniversary of the World War I Armistice - TASS], so he will have an opportunity to hold brief conversations with other participants, including Netanyahu," said Peskov. 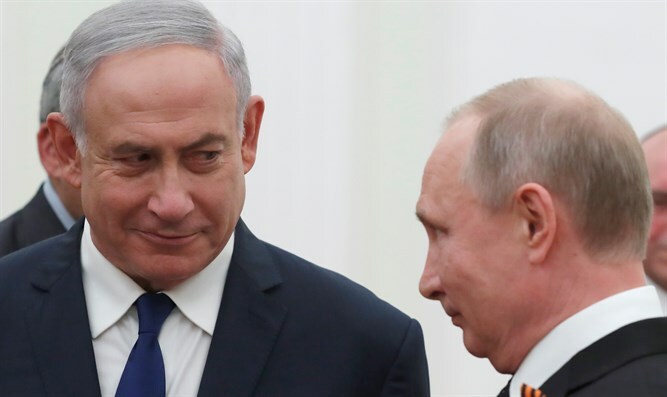 "A bilateral meeting [between Putin and Netanyahu] will depend on the decisions that the [Russian President] and the [Israeli] prime ministers will make, but the current agenda does not include it," Peskov added. His comments came a day after a senior Israeli official indicated that Netanyahu and Putin could meet next month to discuss the situation in Syria. Netanyahu and Putin have held several meetings in recent months over Israel’s concern over the Iranian presence in Syria. Relations between the countries have cooled since the downing of a Russian reconnaissance plane over Syria last month. The Russian government refused to accept the validity of Israel’s investigation into the incident, however. Putin told Netanyahu late last month that he did not accept Israel’s claims that Israel Air Force fighter jets operating in Syria did not use the Russian plane as radar cover.